Lood’s Plumbing, Solar & Gas is registered LP Gas installers, our expertise is obviously Gas Geysers, but we also do gas hobs, gas stoves and gas braaiers. We do Gas Installations and gas geysers in Pretoria East, Pretoria and Centurion. The advantage to our customers is, because we are also qualified plumbers, we are authorized to connect the gas geyser to the existing plumbing system. This ensures more savings to our clients since they do not need to appoint two companies for one job. We prefer three quality Gas geyser suppliers, Delta Gas Geyser, Atlas Gas Geysers and Kexin Gas Geysers. With the increasing costs of electricity and conventional methods of water heating, a gas geyser can save you money each month. With a gas water heater, you are not paying for your geyser to be kept warm all the time because gas geysers works with pulse igniters that ignites the moment you open your warm water tap. Also the second you close the hot water tap your gas water heater stops, giving you hot water on command. Replace your electric Geyser with an Instant L P G Water Heater & Save on Energy costs. Economical Hot Water .Energy efficient, Water is only heated when required. Hot Water available off the Power “Alert” Grid. The “Future” of Domestic Hot Water. This is a single installation where the current electrical geyser has been switched of and the water valve (tap) at the geyser has been turned off. There is only a single gas bottle in this option. 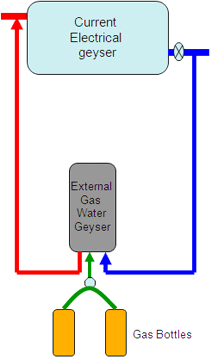 This is a double installation where the current electrical geyser has been switched of and the water valve (tap) at the geyser has been turned off. 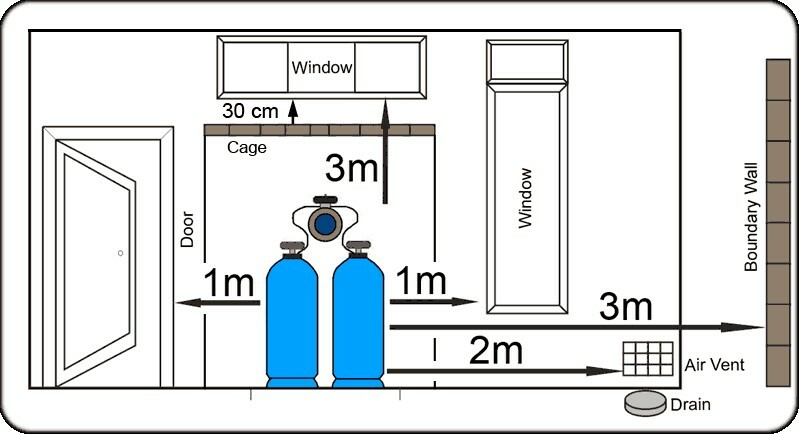 There is two gas bottles which can be switched between if the one bottle is empty. This is a dual installation where the current electrical geyser can be switched to any time by opening and closing the water valves (taps). 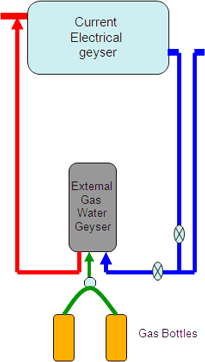 By just changing the direction of the cold water either the electrical or gas geyser can be used. 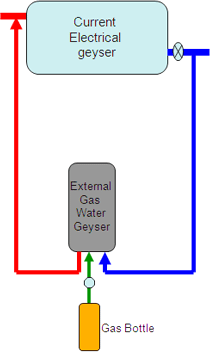 The electrical geyser should still be switched off when the Gas Water Geyser is in use.